The roosters start crowing at around 3am in the morning and the dogs start barking soon after. Before the sun even rises, the village stirs and comes to life. Music signals that the restaurant on the main stretch is open for business as their two TVs switch on and radios add to the growing sounds of the village coming to life. Family run stores open up along the main road that runs through the centre of the village and adults begin preparing for the day by sweeping and clearing some of the garbage that has blown up against their store fronts and homes. Just before 7am, several school aged children might be seen hopping onto their bicycles and riding off to the local government school while others look on and settle in to help run their family owned businesses. Main street running through the centre of the village. 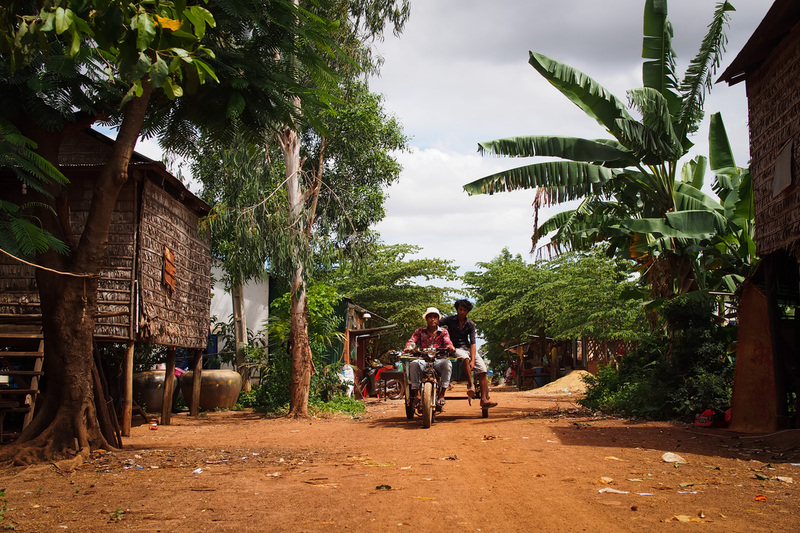 If you walk down the main street of Tang Khiev today, you might not realize that only a few years ago, the families here were once living in the heart of Phnom Penh. Evicted in January 2009 and again in October of the same year, the community now finds itself approximately 40 km north of the capital city of Phnom Penh at the base of Oudong Mountain. It hasn't always been easy, but the people here have slowly come together and have worked hard to make this location their home.